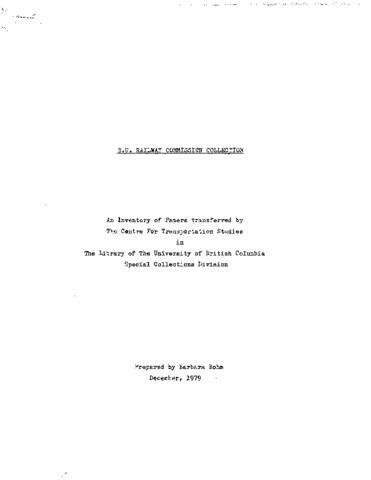 The Centre for Transportation Studies prepared reports on B.C. Rail relating to the Royal Commission on B.C. Railway of 1977. These records were collected and generated by faculty and students at the Centre for Transportation Studies in the course of preparing six reports on B.C. Rail relating to the Royal Commission of 1977. The collection consists of subject files including photocopied and manuscript notes and sources, correspondence, research data, computer printout and input material, reports, financial records, and photographs relalting to the Royal Commission on B.C. Railway (1977).